Riz Ala Jaj (Chicken with Spiced Rice) – Flogging Delicious! As I sat down to write this post I thought I would ask my mum what she likes so much about this dish. Her reply? “Don’t ask me what I like about it!” That’s because this dish has to be one of her favourites, and mine too for that matter. It’s made with lovely, moist chicken cooked in a stock filled with cloves, cardamom pods and black peppercorns, and served on top of beautifully spiced, fragrant rice cooked with minced meat. 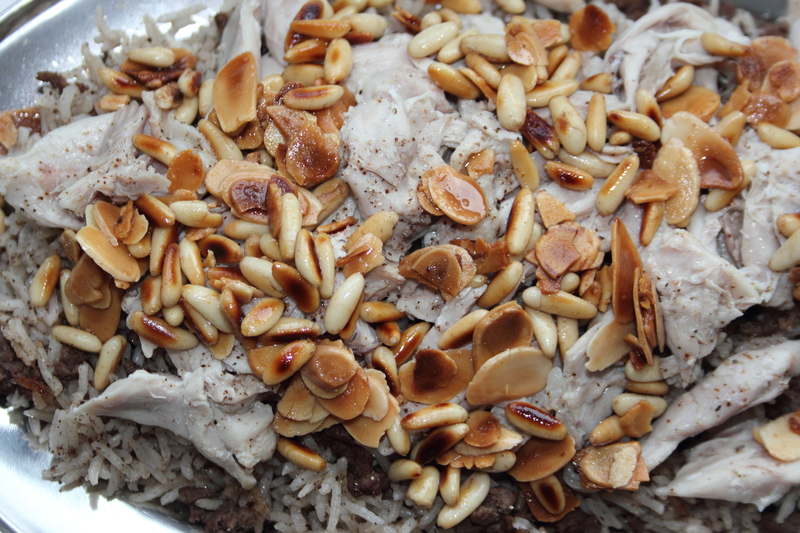 The best bit though has to be the crunchy golden pine nuts and flaked almonds that top the rice and give it extra bite, with a great hint of nuttiness. It’s super simple to make but looks so nice on the table, served with plenty of lemony salad next to it. Or if you’re like my brother who’s a bit of a yoghurt fiend, with some seasoned strained greek yoghurt on the side. It’s delicious either way! Perfect at the weekend when entertaining guests, spending an evening in with the family, or as an easy lunch the next day if you’re at work and like to make the most of leftovers. When it comes to boiling chicken, I usually use a pressure cooker to save a bit of time during the week. However, if you don’t have one, don’t sweat it. Grab yourself a heavy-based pot and pop your chicken pieces in. Throw in your quartered onion, peppercorns, cardamom pods, cloves and salt, and pour boiling water from your kettle on top of the chicken until it’s covered by about 4 inches. If you’re using a pressure cooker, once the chicken reaches boiling point, seal the lid and pressurise it. Once pressurised, turn the heat all the way down and leave to cook for a good 45 minutes, until completely cooked through. If you’re using a standard pot, leave your chicken to boil vigorously on high heat for ten minutes, before turning the heat back down to medium and boiling until cooked through. This should take about an hour, or until thoroughly cooked, with the juices running clear. Once your chicken is cooked, turn the heat off and remove the pieces to cool. Don’t discard the water though, you’re going to need it! Grab yourself a small pot in which to cook your rice. Add your tablespoon of vegetable oil and fry your lamb mince until browned on all sides. Stir in your 7 spices and continue frying until cooked through. Now, add your cup of rice to the pot, and 2 cups of stock leftover from your cooked chicken. Bring to the boil and as soon as it reaches boiling point, cover and turn the heat down to low, cooking for approximately 15-20 minutes. You want to make sure the rice is fluffy and that when you stir the rice, all the water has been absorbed. While your rice is cooking, fry your pine nuts in a drop of oil until golden brown on all sides, followed by your flaked almonds. Alternatively, you can toast these in a dry pan if you want a slightly healthier option. Set to one side. Your chicken should have cooled enough by now for you to debone it and remove any skin. Tear your chicken into bite sized pieces and discard all the bones. Now that your rice is cooked, you can turn it out into a nice serving dish, topping it with the chicken pieces and sprinkling with the nuts. Season with some freshly ground pepper and enjoy with a side salad or some yoghurt. And please, do tell me what it is you like about it!